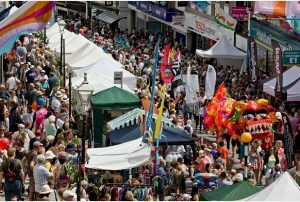 Cornwall has a rich and vibrant festival tradition with each little town having their own unique celebration each year… Everything from the grand, the ‘weird’, and the wonderful! Here is a list of some of them in order of how they are celebrated throughout the year. March – Celebrations in Falmouth, Redruth, Bodmin and Perranporth to celebrate St Piran, the Patron Saint of Cornwall. Plus the ‘Trelawny Shout’ in pubs across Cornwall! April – An impressive display and celebratory convoy of vintage steam powered vehicles, model exhibitions and fairground rides making it a great day out for the whole family. May – The famous Flora Day celebration is believed to be pre-Christian and at one time during the Victorian era was banned as being “a drunken revelry.” Dancing begins at 7am. A great family day out. 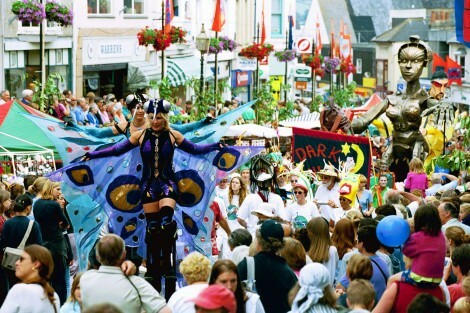 May – Padstow celebrates Mayday in a unique way, and the custom that has been carried out by Padstonians over centuries has not been allowed to die out. The exact origins of the tradition is unknown, but like other festivals during spring it is thought to be connected with the ancient Celtic festival of Beltane. May/June – Celebrating life on the River Fal this is a community festival encompassing over 150 events, including a fish festival, gig racing, swimming, wildlife walks and lots more. June- Cornwall’s showcase since 1793 and a fascinating glimpse into rural life. Apart from the livestock judging, there is the famous flower tent, show jumping and a fast and furious inter-hunt relay. June – A fantastic free festival of maritime music and a great way to soak up the true atmosphere of Falmouth’s seafaring past with performances by dozens of groups from all the UK and beyond. 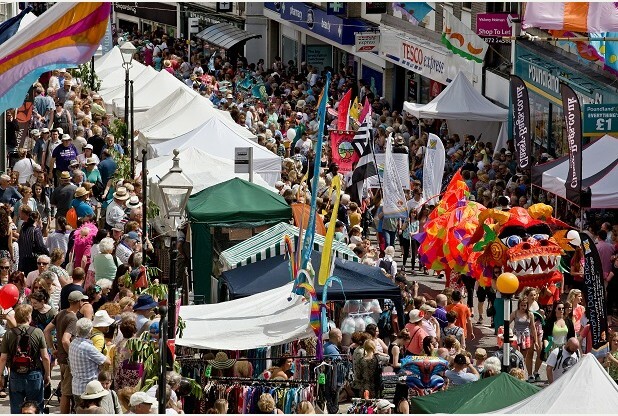 June – Penzance community celebration of the traditional Feast of St. John. The festival has a packed programme of artists in celebration of music, performing arts & theatre. July – An annual event celebrating community arts with twelve hours of free entertainment to suit every taste, with street performers, stalls, refreshments, bouncy castles and three spectacular processions. August – Live music throughout the day and evening, stalls from local producers, pasties and cream teas, whole foods and a wonderful atmosphere not to be missed. End of August – Celebrating all things fishy in Britain’s premier fishing port where you can satisfy your appetite with the best seafood you’re likely to find anywhere and help to raise money for the Royal National Mission to Deep Sea Fishermen. Beginning of September – The Esedhvos Festival is held every year at a different location in Cornwall to celebrate Cornish literature, art, music, dance and sport; to link Cornwall with other Celtic countries. September – With around 300 events, there is something for everyone, so join in the St Ives September Festival celebrations – two weeks of great music, exhibitions, walks, talks, workshops, films, comedy, theatre, plays. October – Packed with cookery demonstrations by leading local chefs, oysters, seafood, wine and local ale, sea shanties, and marquees brimming with Cornish produce. October + November – Annual celebration of Cornish and international filmmaking. The Festival offers local and national premieres, professional development workshops, lectures and parties. November – The hugely anticipated Truro City of Lights Festival and Parade lights up the city in in spectacular fashion delighting the crowds who gather for this spectacular festive event.